Have you ever wanted to watch a set from the side stage and see one of your favorite artists perform at a major festival? Well, your chance to see STS9 from side stage at Euphoria this weekend in Austin, Texas is here!!!!! Euphoria Music and Camping Festival has partnered with Jambase to provide one lucky fan and their guest with the experience of a lifetime. 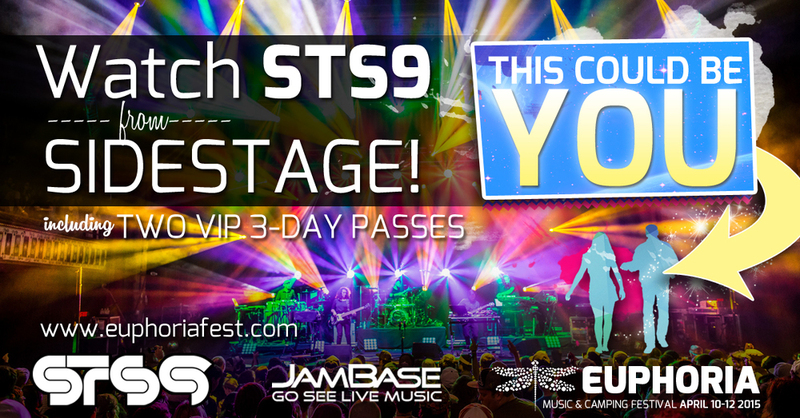 This giveaway will include the opportunity to see STS9 from the sidestage throughout the duration of their set, and also a 3-day VIP package to use for the course of the entire weekend! All it could take to win is a quick entry at this link HERE! Don’t miss out on this once in a lifetime opportunity brought to you by Euphoria Music Festival and Jambase, enter now!